Arsenal brought themselves right back into contention for a top four finish in the Premier League as they beat Chelsea 2-0 at the Emirates Stadium on Saturday evening, in a match that saw Lucas Torreira recalled to the starting XI. Manager Unai Emery had preferred a 3-4-3 system in previous weeks that had only incorporated two central midfield players, and the Uruguay international missed out on a place in the side to Granit Xhaka and Matteo Guendouzi for the 4-1 win and 1-0 defeat against Fulham and West Ham United respectively. However, both he and the aforementioned duo all lined up against Maurizio Sarri’s men in the capital as the Gunners looked to record three points following a patchy run of form, and they did exactly that to close the gap with their opponents to just three points. 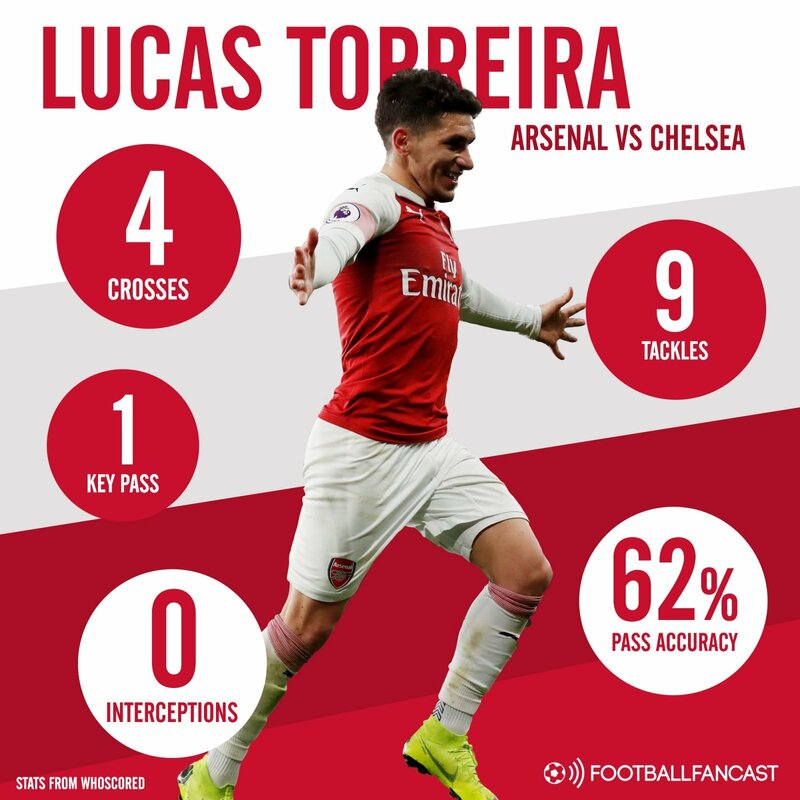 Torreira was his usual battling self in the middle of the park for the hosts against the likes of N’Golo Kante and Mateo Kovacic, and in many ways it was another performance that shows why he has made 29 appearances in all competitions this season following his summer move from Sampdoria. The 22-year-old produced a game-high nine tackles – four more than anyone else on the pitch – while he also made three clearances and whipped in an impressive four crosses, as per stats-based website WhoScored, to prove he is starting to have an effect in the final third for his team. However, there were some slightly more worrying numbers that perhaps show why Emery didn’t start him against Fulham and West Ham and why he isn’t starting every Arsenal match – the South American ace failed to make a single interception against the Blues and had a passing accuracy of just under 62%. While that may be a result of trying to produce those key attacking balls from a slightly deeper position, it is clearly something that needs to improve if he is to continue in that role. Time is on his side though, and there is no reason why Torreira cannot develop into more of an all-round midfielder in the future.